Welcome to our meatiest update ever! This is first of what we hope are many upcoming monthly updates (switching away from quarterly). I’m making a promise for monthly updates but if we can make them sooner we will push them out sooner. 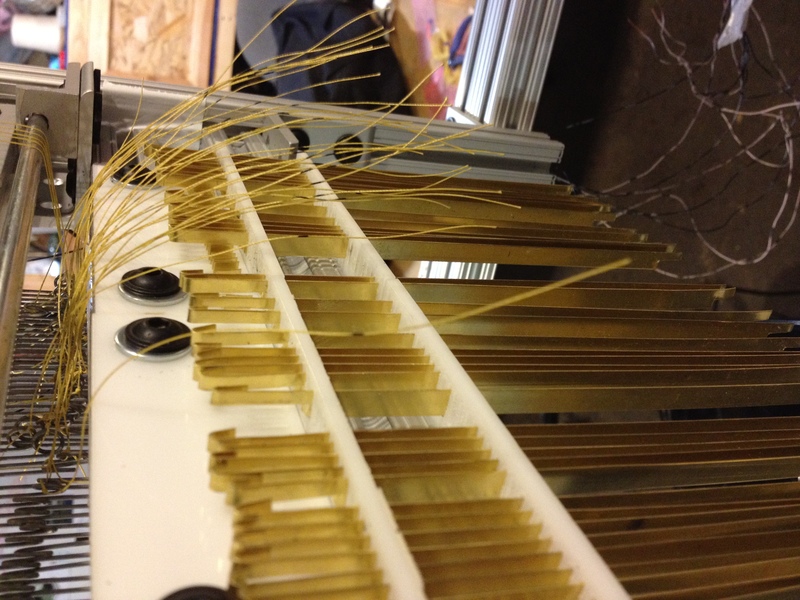 Trust me – the minute we have anything new to show and especially the minute we have our full actuating system going and weaving we will post it! Our goal is to have the 64-thread actuator prototype documentation online by the end of the year and to then continue onto the larger version. I think once we open up the alpha project by publishing the documentation the push forward on the project from the community will be quite lovely. We hope that we have a good base for us (and others) to build upon. Read on for more information! 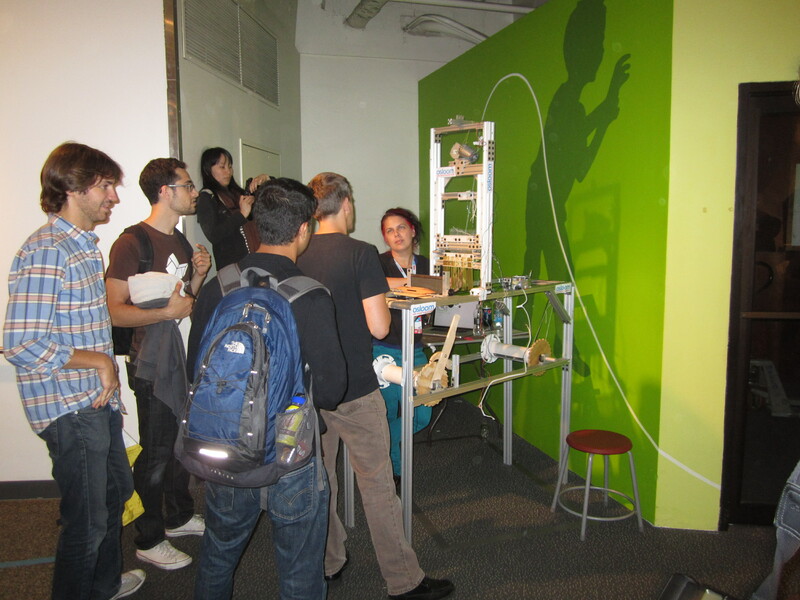 The alpha prototype of the 3rd actuator and most of the development team was at Open Hardware Summit on September 27 held at Eyebeam Art + Technology Center. 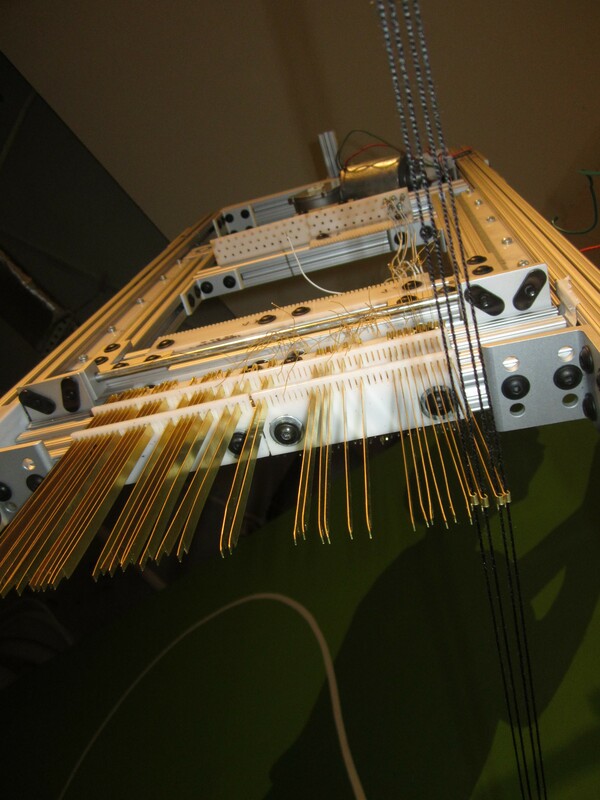 The loom had 4 actuators working during this demo and we proudly dressed it for the first time with 4 threads to demo the actuator. All in all it was a resounding success! 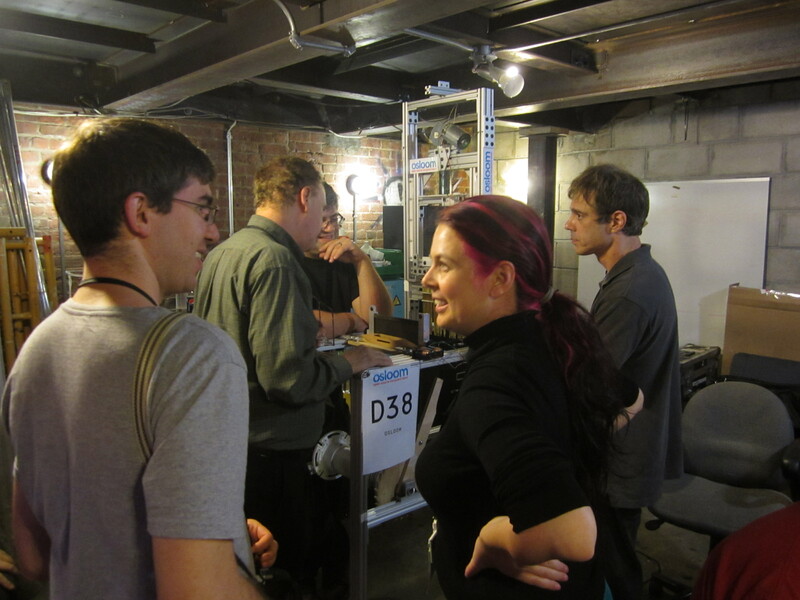 We had amazingly wonderful conversations with countless incredible folks who are someway or another involved with Open Hardware. We received lots of positive feedback!!!! We hadn’t planned on attending the NYC World Maker Faire but at the OHS Dale Dougherty asked if we were presenting at the Maker Faire. When we said no, that we hadn’t made the cutoff he asked if he found space would we show. YES! 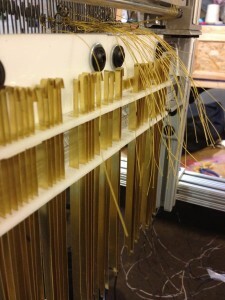 Of course we would showcase the loom at Maker Faire!!!! I was incredibly honored by Mr. Dougherty for asking! The team at the Maker Faire were incredible people – they found us an amazing spot!!!! Unfortunately, we were only able to show on Saturday. We had early flights out Sunday. 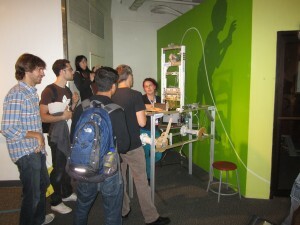 On Saturday, we had really wonderful responses from folks attending and participating at the Maker Faire! It was an incredibly exciting event! 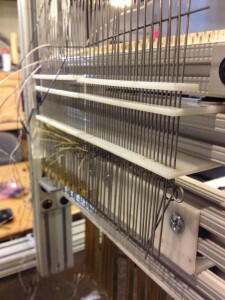 The alpha prototype has a 64-thread count and is on an aluminum extrusion frame. The actuators we are using are muscle wire. They contract when electricity is run thru it. The loom itself is a little under 2 feet wide by 4 feet long by about 7 feet tall. 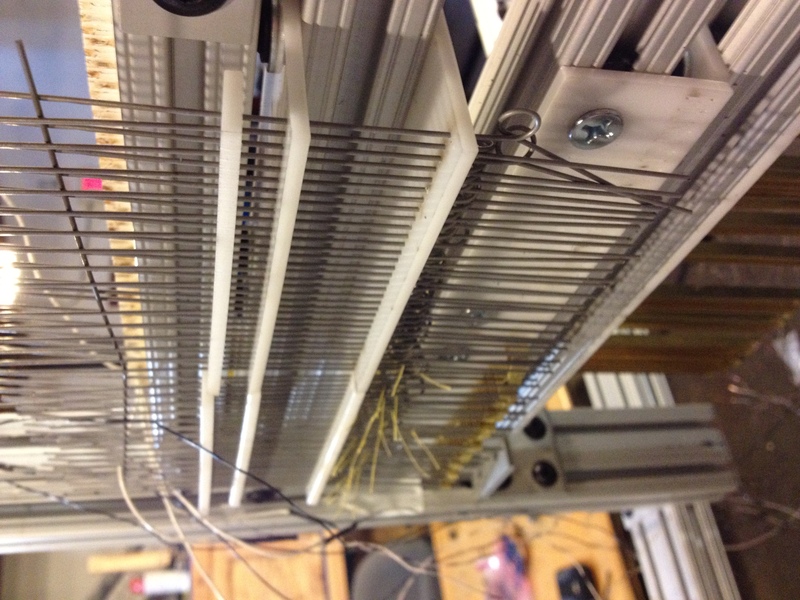 The loom is controlled by software running on a laptop via an Arduino using a bit-shift register circuit. The software is coded in openFrameworks and is rather basic at the moment (you can see a screenshot in the above Hack-a-Day video). It works off bitmap images – for those of you that use the Bhakti Ziek/Alice Schlein technique of using Photoshop to make your weave structures all you’d need to do is export as a bmp and open that up in the module and you are ready to go. For folks that don’t know how to weave we will have a few preset twill and satin weaves that you can just add at a click of a checkbox right inside the software module. 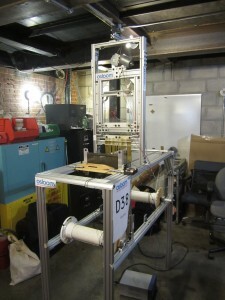 We will spend the next 3 months finishing up this actuator and weaving with it, assembling it, disassembling it, reconstructing it, making circuit diagrams, making assembly instructions, photographing it and creating all the documentation and uploading it on website we are revamping with an FAQ, a wiki and a forum. Everything will be accessible via the website – the Open Hardware and the Open Software. 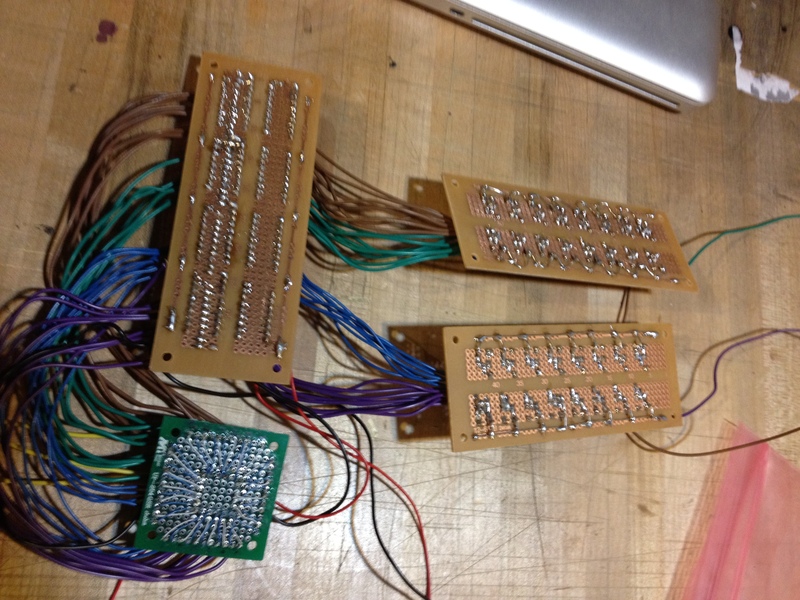 We are streamlining the hardware, adding features to the software and refining the circuit/microcontroller design. Documentation will include full instructions,plans and how to videos on making the parts of the 64-thread alpha actuator. Emails will be answered but expect a bit of a delay on replies on our end as we would rather spend every free minute we have on documentation to get the alpha model out a.s.a.p. The first question I always receive is if and where the info to make on is online. The second question I’ve been asked by an incredible amount of people is are there kits kits and if we will be creating kits for this project. It seems almost every Open Hardware project has a kit that is available. We are going to see how we can make this happen and how cheaply we can make the components. Since many of the pieces of this prototype are handmade we are going to see if we can get those manufactured locally. Being in Northeast Ohio does have its perks as there are still many small manufacturing places. We will have to see if that makes sense. Some of the parts are laser cut and some of the other parts do take a little manual dexterity but mainly it is the time consuming factor of handmaking the components that we’d like to eliminate. 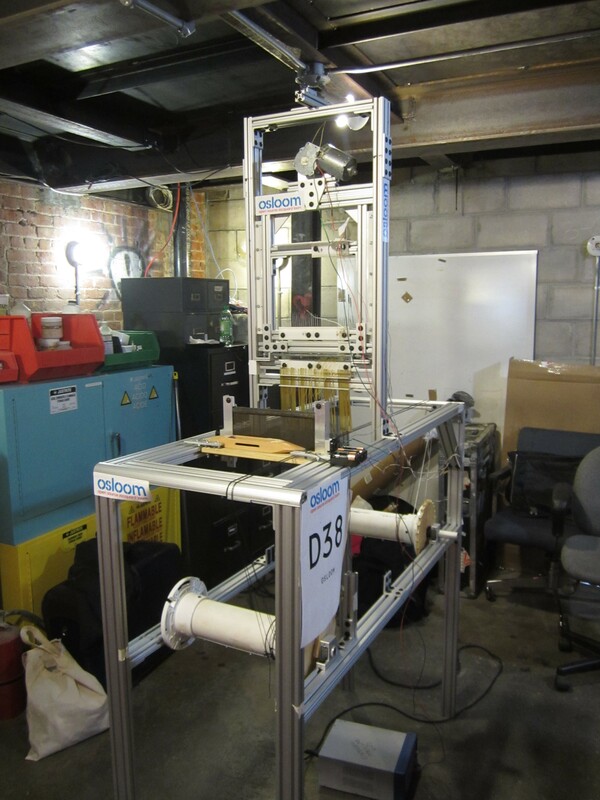 I would like to give my heartfelt thanks to the development team for embarking on this adventure with me and for their volunteered efforts to make OSLOOM a reality: Ed Bennett, Chis Yanc, Markus Vogl, Gary Shimomura. I’d like to thank those who have assisted along the way and to our two lovely support team members: Anna Yu and Jeanne Tyler for assisting the team oh so many times and on so many tasks. Thanks to our friends in Chicago that aided us with a place to stay during our many development sessions. Again thanks to Pumping Station One in Chicago for all the support for this project. A thank you goes out to Kent State University and the Farris Family Award for helping fund the project allowing us to refine the actuator mechanism. A special thank you goes out to Bhakti Ziek – without you the walk down the path for this loom to come to fruition would never have started. Expect a bear sized hug when our paths cross again. And finally to my lovely Kickstarters, there is a special place in my heart for you and your support and your incredible patience. It was wonderful to finally meet some of you in person at the OHS and Maker Faire. I am eternally grateful to you all!